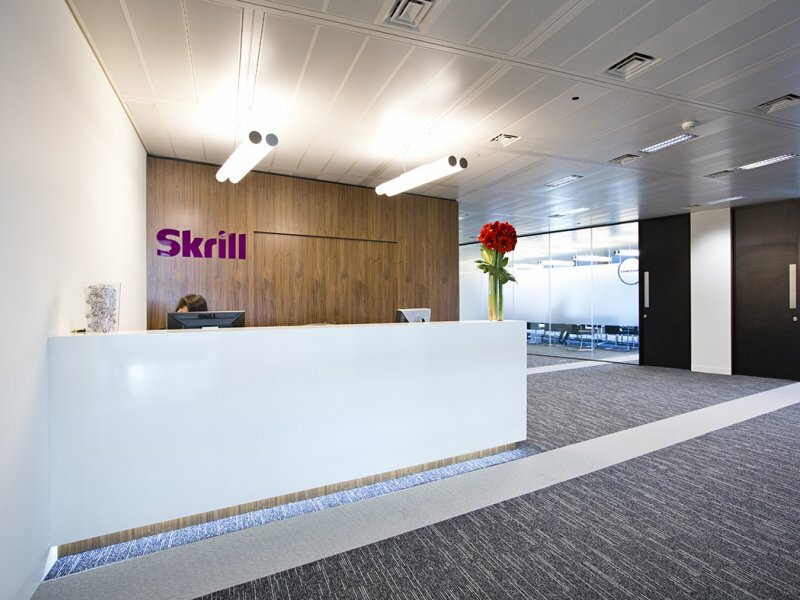 Looking to upgrade the interior design of its reception in Canary Warf, London, Skrill called on GTA Interiors and Clarke Rendall, to bring a creative approach and technical skills to their reception area. 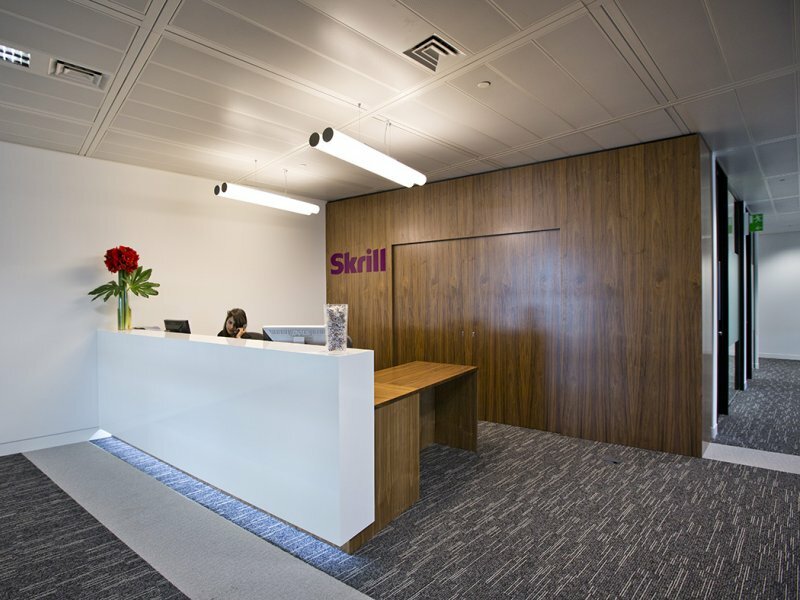 Having worked with Clarke Rendall previously, Skrill and GTA Interiors were looking for a bespoke design to modernise the receptions and give the area a sleek and modern look. The company, which is situated in the heart of Canary Warf and surrounded by innovative companies, wanted to focus on modern clean lines with a twist as the main design elements. 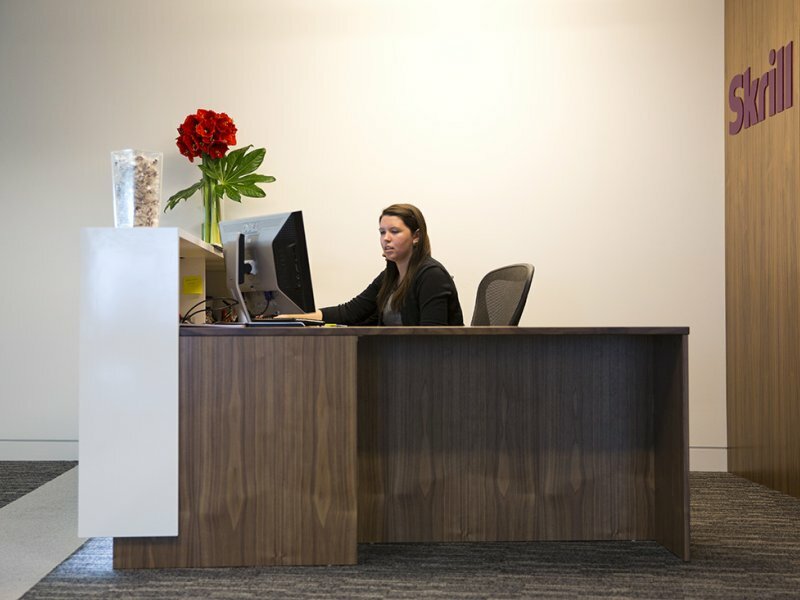 After carefully considering the client's wants and requirements, Clarke Rendall suggested using Polyrey's white compact laminate for the desk, as it allowed for the reception to have a clean finish. The laminate company's Monochrom range gives clients a product which is decorative but is also the perfect solution for demanding situations with high usage. Skrill were able to use this thick white core freestanding laminate reinforced to resist to all sort of impact and stain and antibacterial treatment to brighten the desk while also offering durability, especially during high traffic times of the day. Along with the white core compact and HPL, Monochrom also comes in a deep black core to ensure sleek and luxurious designs in three different textures. Keiren O'Reilly of Clarke Rendall says: "Having used Polyrey a number of times in the past we advised gta and Skrill to use their products as we knew the compact laminate would achieve the look and durability they wanted." O'Reilly adds: "We tend to use Polyrey due to its durability and its versatility - the different environments where you can use compact and laminate materials are vast. The Polyrey products came on time and the quality was fantastic, and most importantly the client was delighted with the results."